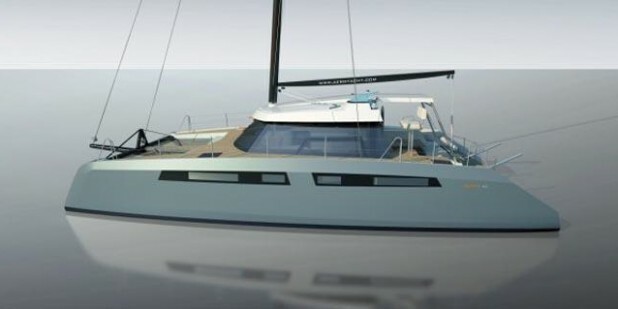 The Alpha 42 -our take on this concept catamaran from Aeroyacht. Love it of hate it a single bulkhead helm will work well on this size of yacht, though it does take up a lot of prime space. Very nice crisp interior with a great all round visibility. I would question the wisdom of a large hatch over the top of the navtronics. Call me cynical but some fool will leave it open at the wrong time. We love the easy to walk around decks however do the aft cabins really need an entrance/moon roof? These have been reported to have incidents of leaking on the Lagoon 62 (where we first saw the concept) plus I cannot think of a more lethal place to put a slippery surface for offshore operation. Being that a perfect blue water cruising day usually involves a good downpour to keep the islands green I cannot understand why the coach roof does not extend further back and out to keep the seating dry? Wiping down wet cushions or being dripped on mid- dinner get’s old pretty quickly! Looking at the coach roof, I feel the overhangs on the windows are not enough. With that amount of glass (lexan) you’ll need a pretty serious air con system to challenge the heat radiation in the salon. All in all, a great concept but one with some surprising flaws when one considers the team behind it. At the end of the day, these are simply drawing and perhaps issues will be illustrated and addressed when the yacht is looked at in practical terms. As a marina based yacht owned by a couple who want an easy to handle boat for short to medium spells aboard we’re excited to see her out and sailing.